1 of 9 Mix together flour, baking powder and salt in medium-size bowl. 2 of 9 Beat butter and sugar on medium-high in bowl 3 minutes, until smooth. Beat in egg and extracts. 3 of 9 On low, beat flour mixture and milk into butter mixture just until combined. Divide dough into thirds; shape each third into ball. Place a third in clean bowl. Add red color; beat until evenly colored. Shape into disk; wrap in plastic wrap; chill 2 hours or overnight. 4 of 9 Clean bowl and beaters. Repeat with another third of dough, coloring it green. Shape, refrigerate as above. Repeat with final third of dough, coloring it yellow. Shape, refrigerate. 5 of 9 Cut green disk into fourths. Return three-quarters of dough to refrigerator. Roll the one-quarter of dough, 1/4 inch thick, between parchment or waxed paper. Remove top sheet. Cut dough into desired shapes with 2-1/2- to 3-1/2-inch cookie cutters. 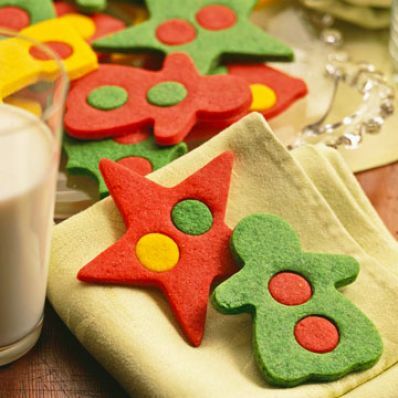 Cut dots out of cookies with 3/4-inch-round cookie or biscuit cutter. Invert whole piece of dough onto nonstick baking sheet. Remove paper. Remove dots to nonstick baking sheet. Remove scraps; wrap; refrigerate along with sheet of cookies and dots. 6 of 9 Repeat step 5 with red dough. Then repeat step 5 with yellow dough. Keep all unused dough and unbaked cookies and dots on baking sheets refrigerated. 7 of 9 Interchange dots among holes in different-colored cookies. 8 of 9 Heat oven to 350 degrees F. Bake cookies 6 to 8 minutes, until edges just begin to brown. Cool cookies on racks. 9 of 9 Repeat rolling, cutting, baking in steps 5 to 8 using a quarter of dough at a time; then use refrigerated scraps. Per Serving: 9 g carb., 3 g Fat, total, 12 mg chol., 2 g sat. fat, 0 g fiber, 68 kcal cal., 13 mg sodium, 1 g pro.